Anglo-Italian cultural connections in the eighteenth and nineteenth centuries have been the subject of numerous studies in recent decades. Within that wider body of literature, there has been a growing emphasis on appreciation of the history and culture of Renaissance Italy, especially in nineteenth-century Britain. In 1954 J.R. Hale's England and the Italian Renaissance was a pioneering account of the subject, followed in 1992 by Hilary Fraser's monograph The Victorians and Renaissance Italy and in 2005 by Victorian and Edwardian Responses to the Italian Renaissance, edited by John E. Law and Lene Ã˜stermark-Johansen. There is, however, an obvious gap in the literature concerning the pivotal figure of William Roscoe (1753-1831), the first English-language biographer of Lorenzo de' Medici and of Pope Leo X. The Life of Lorenzo de' Medici called the Magnificent proved to be so popular as to prompt the claim that Roscoe effectively invented the Italian Renaissance as it has become understood by subsequent generations of readers in the English-speaking world. 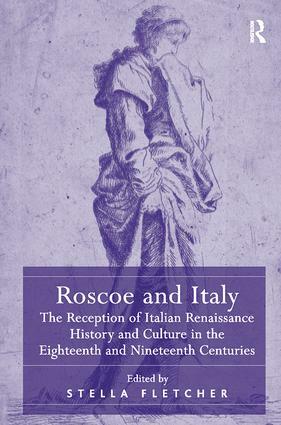 This collection of ten essays redresses the balance by examining Roscoe as biographer, as a connoisseur of Italian literature and as a collector of Italian works of art.